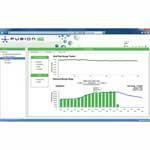 Crestron Fusion enterprise management platform - Management Platform - Crestron Electronics, Inc. The Fusion enterprise management platform enables organizations to monitor and manage AV equipment, BMS, room scheduling, lighting, shades, climate, and energy consumption from a single platform. You can deploy Fusion RV (RoomView), Fusion EM (Energy Management) or both, based on organizational needs.